Attention parents and caregivers: be prepared in case of an emergency. 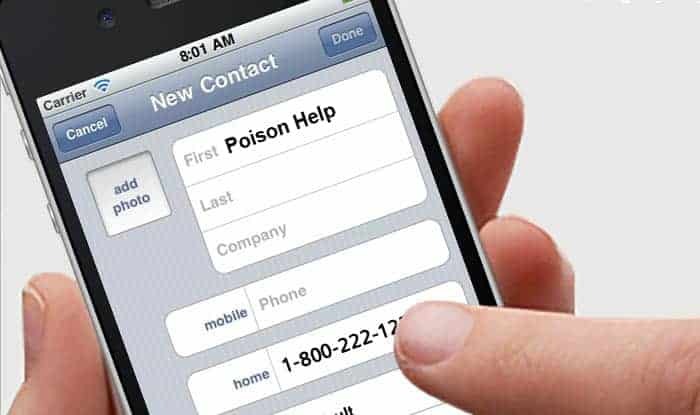 Program 1-800-222-1222, the Poison Help phone number, into your mobile device. The number will automatically connect you to your local poison center when it is dialed anywhere in the United States. Help is a phone call away. Every call is answered by one of the specialists at the poison center. These experts are specially trained nurses, pharmacists and physicians. It is free to the public and to physicians, nurses, and other health professionals, and is completely confidential. We respond to calls from individuals with hearing impairment as well as individuals with limited English proficiency.